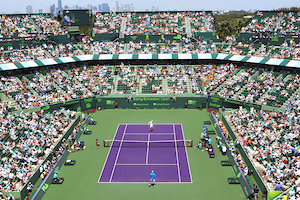 Tag Archive | "Andy Murray"
Novak Djokovic will have the opportunity to defend his Sony Ericsson Open title on Sunday. The world number one ousted Argentine Juan Monaco 6-0, 7-6 to reach the final. What a difference a day makes. Yesterday, Monaco was on cloud nine as he ushered in his 28th birthday by taking apart world number eight Mardy Fish for his first semifinal showing at the Sony Ericsson Open. The Monaco of the quarterfinals was no where to be found the opening set. In twenty-seven minutes, conceding only eight points with two by way of double faults, Djokovic wrapped up the first set. Rafael Nadal is recognized as the ultimate gladiator. For him to wake up this morning and conclude that his body would not cooperate with his wish to combat Andy Murray in the semifinals at the Sony Ericsson Open must have been devastating. Unfortunately, the world number two had to disappoint his legion of fans as a niggling left knee problem forced him to cease from taking court. In facing the media, Nadal explained “since the beginning of the tournament, I have [had] problems. . . The thing is growing worse every day. After the last match, I saw that the situation was going to be complicated to play today. But, as always, I believe that things can improve”. Once a ladies doubles semifinals concludes, Andy Murray and Rafael Nadal will grace stadium court at the Sony Ericsson Open as each seeks to become a finalist. The world number two and four have budded heads eighteen times previously with Nadal the winner on thirteen of those occasions. Murray is the 2009 champion in Miami while Nadal has been the runner-up three times including last year. For fans hopeful of a rematch between Novak Djokovic and Rafael Nadal in the Sony Ericsson Open final, neither man will have a comfortable trip in getting there. Djokovic could contend with Marcos Baghdatis in his opening match, countryman Viktor Troicki in the third round or Richard Gasquet in the fourth round. Also, in the quarterfinals, Juan Martin Del Potro or the relentless David Ferrer may stump the world number one. Moreover, besides Nikolay Davydenko who was unable to defend his 2008 title due to injury, since 2006 no prior year’s champion has advanced beyond the round of 16. Roger Federer feted the twentieth anniversary of the Dubai Duty Free Tennis Championships in a memorable manner. In the final, Federer bested Andy Murray 7-5, 6-4 to claim a record fifth trophy. The last time, Federer and Murray clashed was at the ATP World Tour Champions in 2010. Although the former was victorious, in their head to head, Murray led 8-6. In the semifinals, Murray dispatched Novak Djokovic in straight sets to hand the Serb his first knockdown of the year. Moreover, Murray stopped Djokovic from seeking a fourth consecutive title. Consequently, Murray came into the final full of confidence. On the other hand, Federer has been brilliant of late. He was going for his second title in a row in his last two tournaments. In a thrilling five set, five hour and fifty-three minute combat, Novak Djokovic halted Rafael Nadal 5-7,6-4,6-2,6-7,7-5 to earn his second consecutive Australian Open trophy, the third of his career. With Djokovic having carried their last six encounters, all of them finals, Nadal was eager to find a solution to this troubling riddle. Early on, things looked promising for Nadal. By pressuring his rival into two successive backhand miscues, Nadal got the break for a 3-2 lead in the opening set. After fighting off a couple of break points, Nadal eventually consolidated for 4-2. On his fifth break point opportunity, Djokovic converted on a forehand error by Nadal and leveled the set at 4 a piece. But serving at 5 all, Djokovic surrendered his serve by mishitting a backhand down the line. Nadal captured the next game to bag the first set. For the second day in a row, rain disrupted the proceedings at the Legg Mason Tennis Classic. But this afternoon, even that was insufficient for top seed and wildcard Gael Monfils to prevail. Unseeded Radek Stepanek bested Monfils 6-4,6-4 to win this ATP 500 tournament, the biggest prize of his career. With a record of 5-2 against Stepanek, Monfils seemed in good stead to become the first Frenchman to triumph in the nation’s capital since Arnaud Clement beat Andy Murray in 2006. For his part, Stepanek was on a quest to end his nation’s 29 year drought at this venue. Petr Korda, Stepanek’s coach, was the last victorious Czech in 1992. The preamble to a disastrous afternoon for Monfils came in his initial service game. Monfils had two successive double faults despite holding. Subsequent to guarding serve, Stepanek struck a backhand crosscourt winner for break point. When Monfils dumped a forehand into the net, Stepanek took a 2-1 lead. In trying to consolidate, Stepanek went down 0-30. However, Monfils obliged with a sleuth of errors to allow the Czech to consolidate for a 3-1 advantage. Later with Stepanek serving, the skies opened up and a thunderous downpour followed. Once Stepanek returned and completed the game for 4-2, showers came anew. When play resumed, Monfils appeared more willing to fight and comfortably maintained serve. Yet despite Stepanek’s horrendous 30 percent first serve, Monfils could not capitalize on his second serve. With Monfils stuck ten feet beyond the baseline and his returns falling short, an aggressive Stepanek proficient at volleying thrived at the net. Consequently, Stepanek easily bedded the first set. For Monfils, the following set was a duplicate of the previous one. 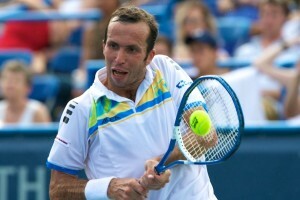 With a backhand volley winner, Stepanek had break point in the initial game. With Monfils’ forehand crosscourt pass finding the net, Stepanek converted. Next, with an emphatic love game punctuated by his maiden ace, Stepanek raced to a 2-0 lead. At times, Monfils uncorked his frustration on his racket. The crowd did it’s utmost to lift the Frenchman, however, without success. Despite losing solely two points his subsequent four service games, Monfils could not fabricate a single break point. Stepanek’s first serve percentage picked up slightly this set at 46, winning 12 out of 12 points. With Monfils’ return not clearing the net, Stepanek had triple championship points. When Monfils flubbed a backhand, Stepanek claimed his first title since San Jose in 2009. He also became the second oldest titlist. Jimmy Connors hoisted the trophy in 1988 at age 35. With yesterday’s semifinals completed in the wee hours of the morning, Monfils did not go to sleep until four. Thus, the Frenchman felt the lack of rest made him “a fraction of a step slower. . . [so I] caught the returns late”. For the second year in a row, Roger Federer is on course to equalize Pete Sampras’ record of seven Wimbledon titles. Defending champion Rafael Nadal is also through to the second week as he goes for his third French Open-Wimbledon duo. While Novak Djokovic, the hottest player this season, is in great form through three matches. The world’s top three players are still the ones to beat heading into the round of 16 while world number four and hometown pick Andy Murray is also alive with an outside chance. Here’s a review of the past few days and a look at the rest of the tournament. Federer has looked superb through the first three rounds of play. The Swiss dominated his third round match against a less than 100% David Nalbandian who’s had his number previously. In the fourth round, Federer takes on Mikhail Youzhny. Federer has won all ten of their prior meetings and the Russian has never been beyond the round of 16 at this event. David Ferrer tied his best showing at the All England Club by reaching the round of 16 and will face Jo-Wilfried Tsonga who was a quarterfinalist last year. The winner of that contest will probably battle Federer in the quarterfinals. After straight sets triumphs his initial two matches, Djokovic had to bear down against Marcos Baghdatis to move on in four in the third round. On Monday, Djokovic meets Michael Llodra in the fourth round. Although Llodra is sensational on grass, he should be no match for Djokovic. For the first time at the All England Club, Rafael Nadal and Novak Djokovic are the top two seeds. Defending champion Nadal will fight to collect his third hardware at this venue and his third French Open-Wimbledon combo. Djokovic who registered his maiden loss of the year at the previous major after a forty-one match unbeaten run will attempt to reach his first final at SW 19. Two other competitors are also hoping to make history. Third seed Roger Federer tries to equalize Pete Sampras’ all time record of seven titles while fourth seed Andy Murray carries the aspirations of an isle on his shoulders. This fortnight, Murray aims to terminate his nation’s 75 year drought at its home major. Here’s the breakdown of the 2011 Wimbledon draw. For world number one Nadal, it should be smooth sailing until the third round. In that session, the defending champion could be bothered by phenom Milos Raonic. Again in the round of 16, Nadal will be on crash alert with Juan Martin Del Potro his likely opponent. Consequently, there are various rocks along the road early on for the top seed. In the quarterfinals, Nadal could face a rematch of last year’s final with Tomas Berdych. Considering Berdych’s average performance this season, the Spaniard should have the advantage. However, a semifinal against either Andy Roddick, a three time finalist, or Murray will be a harder challenge. Having won the Queen’s Club trophy for the second time, Murray has once more found his mojo. Murray’s potential third round counterpart is Marin Cilic and either Stanislas Wawrinka or Richard Gasquet in the fourth round. While these are all worthy adversaries, Murray should have the upper hand.